Looking for a plant that has a bold, bright flavor to spice up your cooking, but doesn't take a lot of backbreaking work in the garden? You may want to consider growing anise. Because I come from an Italian family, anise is a must-have herb around my house. We use it to season pizzelles for every holiday and party. If you've never used anise in your cooking before, the flavor reminds me of licorice, but with more complexity. The pretty little plant is a native to southern Europe and the Mediterranean. 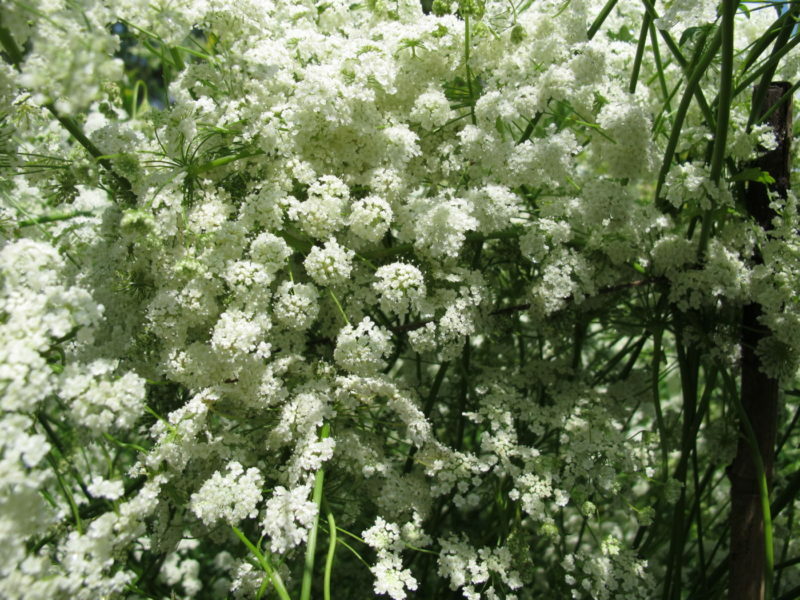 It produces lacy leaves and white flowers on a bushy herb. 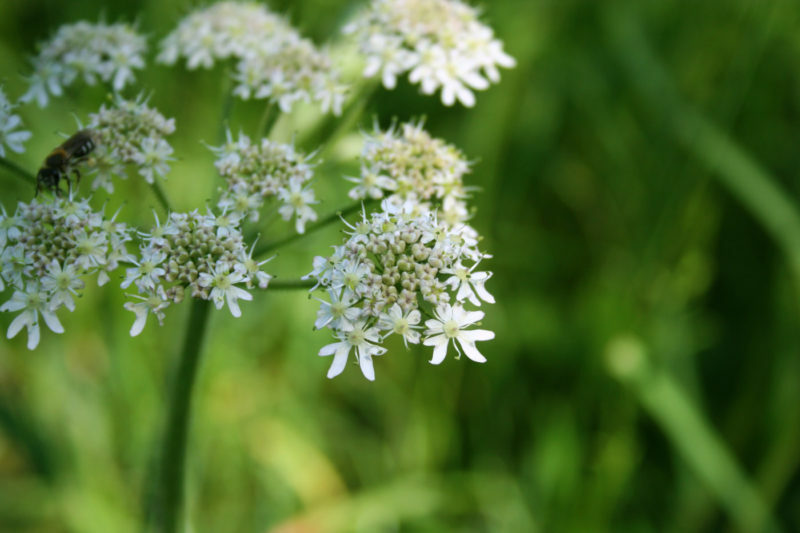 The flowers resemble Queen Anne’s Lace, and the seeds are the most useful part of the plant, similar to caraway and carrot seeds. You can also eat the leaves and root, which have a more delicate licorice flavor. The best part? Growing anise is surprisingly easy. 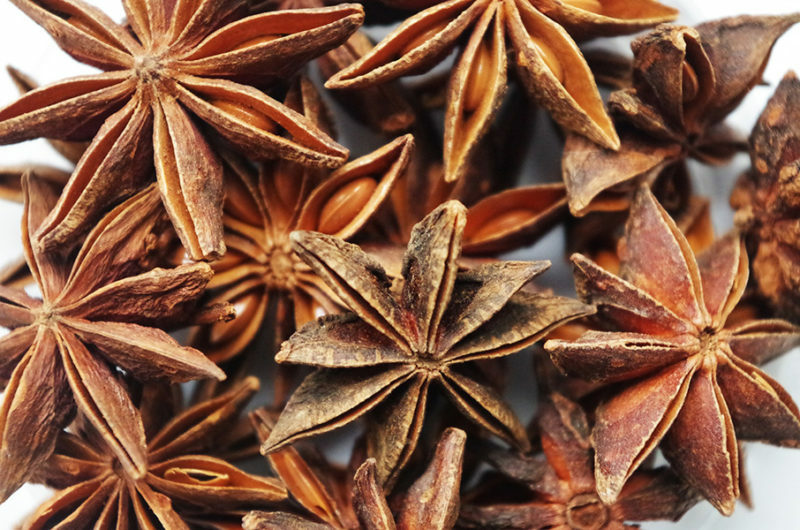 Anise is sometimes confused with fennel and star anise. Let's clarify the difference between the three plants. Although they have a similar flavor, star anise and anise are two distinct plants. They're often confused because of the name. Star anise comes from the Schisandraceae family. The evergreen trees grow up to 65 feet tall and produce the familiar star-shaped fruits that have a peppery, licorice flavor that's more intense than anise. Anise and fennel are sometimes confused because anise seeds look a bit like fennel seeds. They both have a similar licorice flavor, though fennel is bolder. Fennel comes from the same family as carrots (Foeniculum) and is typically grown for its bulbous base, though the fronds are delicious as well. The leaves and flowers look somewhat like anise. Anise ( Pimpinella anisum), on the other hand, is an herbaceous plant from that grows up to 2 feet tall. It produces plenty of delicious seeds that can be used to flavor soups, cakes, candies, and more. Anise grows well within USDA plant hardiness zones 4-9. Anise requires a long growing season of at least 120 days. Start seeds 6-8 weeks indoors before the average final frost date for your area if you have a short growing season. Anise is a warm climate plant, originating in Southern Europe, so it needs plenty of sunlight. Plant in full sun. Anise prefers loamy soil that's rich in organic matter with a pH between 6.0-6.7. If the soil is a bit too acidic, you can add a little bit of lime. The soil should be well-draining, so add compost to the ground if yours has a lot of clay. Add organic matter to your earth if you have soil that is lacking in nutrients. Take the time to break up any clumps, which helps creates the light soil that growing anise plants prefer. Anise is an aromatic plant that can lure honeybees and other pollinators to your garden, so try not to section it away on its own. Anise will benefit your entire yard because it attracts all kinds of beneficial insects. Anise seedlings are delicate, so some people have difficulty transplanting them into the garden. Due to their sensitivity to transplanting, it’s best to start the seeds in biodegradable pots. Doing so helps to disturb the plants and roots as little as possible. The seeds need to be in a warm environment, between 60-72 ℉, to germinate. Another choice is to direct sow anise seeds outside right after the threat of frost passes. You don’t want to wait much longer than that because anise seeds require 120 days to mature. If you live in a colder climate, start them inside to make the most of your growing season. Plant at a 1/2-inch deep into the soil. Germination takes around 7-14 days, so don’t be surprised if seedlings don't pop up right away. Warmer temperatures will help to speed up germination. Once the seedlings are 6 weeks old, you can thin them to 6-12 inches apart. Doing so improves sunlight access and air circulation. For square foot gardeners, place 12 seeds per foot. For row gardeners, put plants 12-inches apart with 2-feet between rows. If you're short on outdoor space, try growing anise in containers. Pick a pot that has drainage holes and is at least 8-inches deep, and fill it with sterile potting mix to 3/4-inch from the top. Sprinkle the seeds and cover them with a thin layer of soil. Gently spray the soil with water to avoid disturbing the seeds. Water anise regularly until the plants are well-established in your garden beds. Plan to water the anise plants two or three times a week until they’re at least 6-8 inches high. Then, you can reduce irrigation. 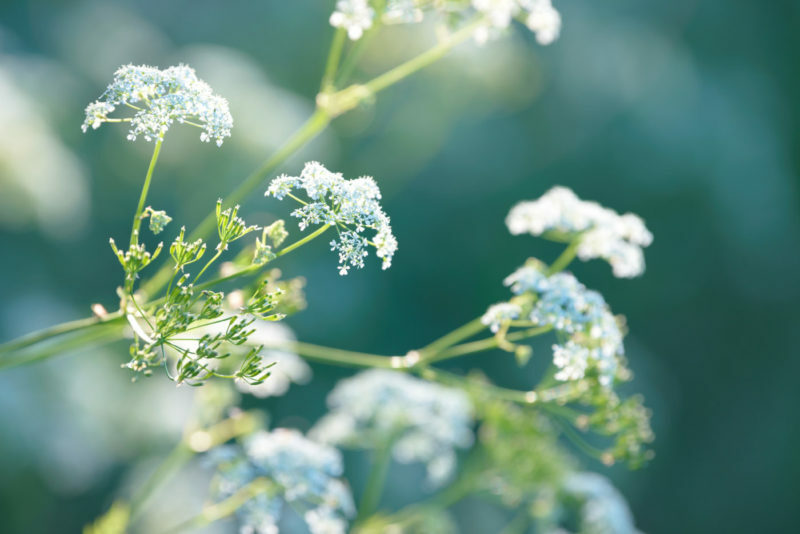 Once established, anise plants can tolerate periods of drought, which makes sense since they originated in areas that are known for their drier climates. Growing anise doesn’t require a lot of fertilization, but they do benefit from an application of a nitrogen fertilizer before they flower in June to July. You can also side dress the plants with aged compost around midseason to encourage growth. Make sure to test your soil before you decide to fertilize. If the soil is poor, then add the fertilizer. Otherwise, fertilizer isn’t necessary for growing anise. Like many plants, anise isn’t a fan of competing with weeds. To control competition, use mulch around the base of your anise plant. Straw or woodchips are good choices. Be careful to avoid putting too much mulch around your plant’s stem because it can lead to rotting. If some weeds do manage to make it up through the mulch, pull them by hand. Anise doesn’t suffer from too many diseases or pests, but here are a few issues you might face. If you find small round, yellow or brown spots on the leaves, you might be facing this fungal disease. Alternaria blight spreads by seed and moisture caused by poor air circulation. To help prevent Alternaria blight, treat the seeds with hot water before you plant them. Keep anise well-watered. You will need to remove and destroy the plant if it shows signs of the disease. The fungi can live on the soil and infect other plants, so make sure to remove all debris from the garden. Downy mildew leads to yellow spots on the upper surfaces of leaves and a white, fluffy growth on the underside. It's a pesky fungus that affects young, tender leaves and is caused by prolonged leaf wetness from watering overhead. To manage downy mildew, make sure you don’t overcrowd your plants to allow air circulation. Also, be sure to water in the morning and at the base of plants. Powdery mildew looks like, as the name implies, powdery growth on leaves. Severe infections can cause the flowers to become distorted. It's a fungus that can spread long distances in the air so you can catch it from your neighbors. This disease prefers high humidity and moderate temperatures, and the infections tend to be the worse in shaded areas. To get rid of powdery mildew, avoid over-fertilizing and use protective fungicide applications. Sulfur applications can help control infections in the early season. Aphids are small soft-bodied insects that cling to the underside of leaves and stems of plants. They’re typically green or yellow, and a heavy infestation can cause leaves to turn yellow or distorted. Aphids release a honeydew onto the plant that encourages the growth of mold, so even if the critters don't bug you, try to keep infestations under control. To get rid of aphids, spray plants with a strong jet of water to knock them off the leaves. Insecticides are only required if the infestation is very strong. Plants can tolerate low or medium infestations without suffering. You can use insecticidal soaps or oils, such as neem or canola oil, to control the population if it gets too large. Armyworms tend to group together and cause irregularly shaped holes in foliage. You might find egg clusters on the leaves with up to 150 eggs. Controlling armyworms can be tricky because they can go through 3-5 generations each year. Organic methods include biologically controlling the armyworms by encouraging natural enemies. You can apply a biological pesticide like Bacillus thuringiensis. You can also use pheromone traps to catch the moths as they land. Cutworms can cause the stems of young plants or seedlings to be severed at the soil line. Irregular holes might show up at the surface of the plants. To get rid of cutworms, remove all plant residue from the soil after the harvest or two weeks before planting. Hand-pick the larvae after dark and spread diatomaceous earth around the base of the plants. You can also apply insecticides to infested areas of the garden or use DIY cardboard plant collars. Anise plants are typically harvested in between August and September when the flowers go to seed. You’ll be surprised at how easy it is to collect anise seeds! Cut the flowery umbrella, called an umbel, while it's still green. If you aren't using the leaves, you can also pull the entire plant out of the ground. 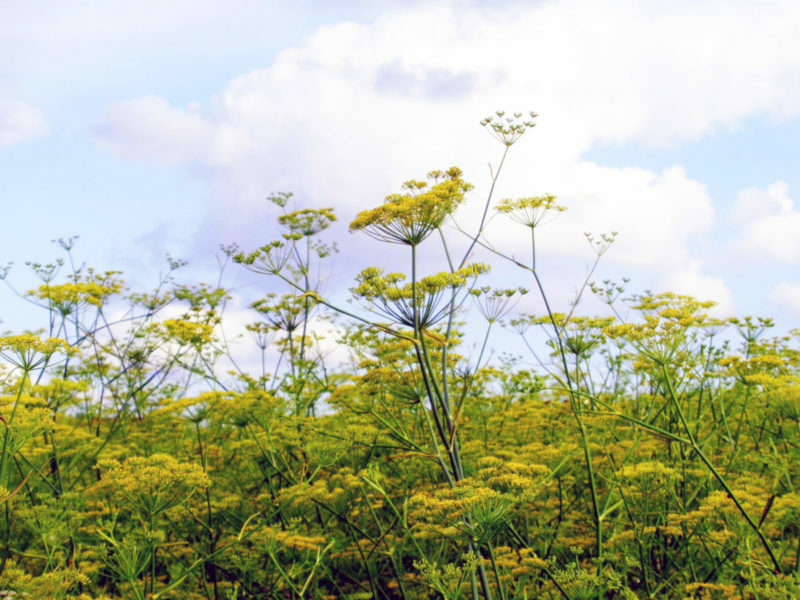 Tie the anise plants or umbels into bundles and put them in a well-ventilated area in indirect sunlight to dry. Make sure the area is warm. Doing this helps the herb and seeds to dry out. Once dried, you can rub the umbel between your palms to help separate the seeds from the hull. Another choice is to tie paper bags around the top of the anise flowers, catching the seeds as they drop out while drying. After harvesting, store the seeds in a cool, dark place in an airtight container. You can also extract anise oil with steam distillation. You can also eat anise leaves. They taste similar to the seeds but are milder. Try them chopped up in salads or as a garnish on desserts or meats like sausage. Snip them off the plant as needed. You can eat the roots, as well. Dig around the plant and gently pull the roots out of the ground. Store them wrapped in a linen cloth in the refrigerator. 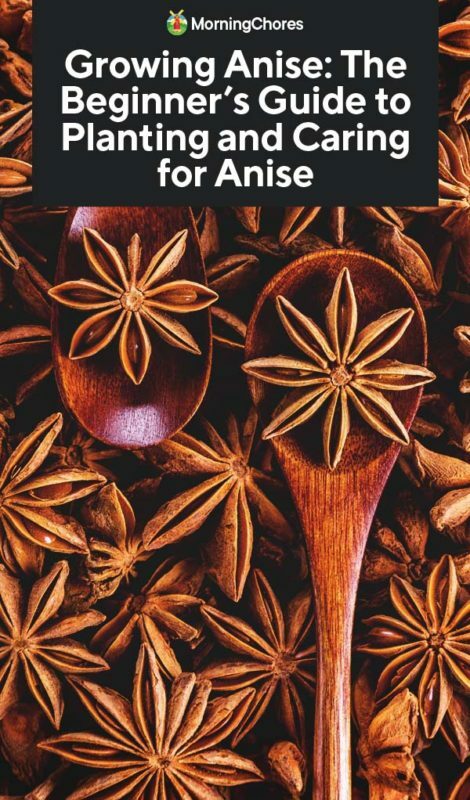 You can use anise seeds whole or ground up in recipes or for medicinal purposes. It's often used as a medicinal herb to treat stomach aches or other digestive issues. Anise deserves a more prominent place in the cooking world, in my humble opinion. Try it in cookies, sprinkled on chicken, or in a cocktail. Let us know your favorite recipes in the comments. ← The Only Bug Killer You’ll Ever Need – And It’s 100% All-Natural!